What Is the Scope and Impact of Diabetes? What Is the Status of Diabetes Research? Almost every one of us knows someone who has diabetes. An estimated 16 million people in the United States have diabetes mellitus -- a serious, lifelong condition. About half of these people do not know they have diabetes and are not under care for the disorder. Each year, about 798,000 people are diagnosed with diabetes. Diabetes is a disorder of metabolism -- the way our bodies use digested food for growth and energy. Most of the food we eat is broken down by the digestive juices into a simple sugar called glucose. Glucose is the main source of fuel for the body. Type 1 diabetes (once known as insulin-dependent diabetes mellitus or juvenile diabetes) is considered an autoimmune disease. An autoimmune disease results when the body's system for fighting infection (the immune system) turns against a part of the body. In diabetes, the immune system attacks the insulin-producing beta cells in the pancreas and destroys them. The pancreas then produces little or no insulin. Someone with type 1 diabetes needs daily injections of insulin to live. At present, scientists do not know exactly what causes the body's immune system to attack the beta cells, but they believe that both genetic factors and viruses are involved. Type 1 diabetes accounts for about 5 to 10 percent of diagnosed diabetes in the United States. The most common form of diabetes is type 2 diabetes (once known as noninsulin-dependent diabetes mellitus or NIDDM). About 90 to 95 percent of people with diabetes have type 2 diabetes. This form of diabetes usually develops in adults over the age of 40 and is most common among adults over age 55. About 80 percent of people with type 2 diabetes are overweight. In type 2 diabetes, the pancreas usually produces insulin, but for some reason, the body cannot use the insulin effectively. The end result is the same as for type 1 diabetes -- an unhealthy buildup of glucose in the blood and an inability of the body to make efficient use of its main source of fuel. Gestational diabetes develops or is discovered during pregnancy. This type usually disappears when the pregnancy is over, but women who have had gestational diabetes have a greater risk of developing type 2 diabetes later in their lives. Diabetes is widely recognized as one of the leading causes of death and disability in the United States. According to death certificate data, diabetes contributed to the deaths of more than 193,140 persons in 1996. Diabetes is associated with long-term complications that affect almost every major part of the body. It contributes to blindness, heart disease, strokes, kidney failure, amputations, and nerve damage. Uncontrolled diabetes can complicate pregnancy, and birth defects are more common in babies born to women with diabetes. 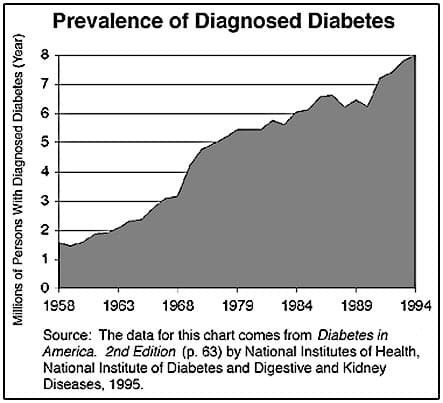 Diabetes cost the United States $98 billion in 1997. Indirect costs, including disability payments, time lost from work, and premature death, totaled $54 billion; medical costs for diabetes care, including hospitalizations, medical care, and treatment supplies, totaled $44 billion. Diabetes is not contagious. People cannot "catch" it from each other. However, certain factors can increase one's risk of developing diabetes. People who have family members with diabetes (especially type 2 diabetes ), who are overweight, or who are African American, Hispanic, or Native American are all at greater risk of developing diabetes. Type 1 diabetes occurs equally among males and females, but is more common in whites than in nonwhites. Data from the World Health Organization's Multinational Project for Childhood Diabetes indicate that type 1 diabetes is rare in most Asian, African, and American Indian populations. On the other hand, some northern European countries, including Finland and Sweden, have high rates of type 1 diabetes. The reasons for these differences are not known. Type 2 diabetes is more common in older people, especially older women who are overweight, and occurs more often among African Americans, Hispanics, and American Indians. Compared with non-Hispanic whites, diabetes rates are about 60 percent higher in African Americans and 110 to 120 percent higher in Mexican Americans and Puerto Ricans. American Indians have the highest rates of diabetes in the world. Among Pima Indians living in the United States, for example, half of all adults have type 2 diabetes. The prevalence of diabetes is likely to increase because older people, Hispanics, and other minority groups make up the fastest growing segments of the U.S. population. Before the discovery of insulin in 1921, all people with type 1 diabetes died within a few years after the appearance of the disease. Although insulin is not considered a cure for diabetes, its discovery was the first major breakthrough in diabetes treatment. Today, daily injections of insulin are the basic therapy for type 1 diabetes. Insulin injections must be balanced with meals and daily activities, and glucose levels must be closely monitored through frequent blood sugar testing. Diet, exercise, and blood testing for glucose are also the basis for management of type 2 diabetes. In addition, some people with type 2 diabetes take oral drugs or insulin to lower their blood glucose levels. People with diabetes must take responsibility for their day-to-day care. Much of the daily care involves trying to keep blood sugar levels from going too low or too high. When blood sugar levels drop too low -- a condition known as hypoglycemia -- a person can become nervous, shaky, and confused. Judgment can be impaired. Eventually, the person could pass out. The treatment for low blood sugar is to eat or drink something with sugar in it. On the other hand, a person can become very ill if blood sugar levels rise too high, a condition known as hyperglycemia. Hypoglycemia and hyperglycemia, which can occur in people with type 1 diabetes or type 2 diabetes, are both potentially life-threatening emergencies. People with diabetes should be treated by a doctor who monitors their diabetes control and checks for complications. Doctors who specialize in diabetes are called endocrinologists or diabetologists. In addition, people with diabetes often see ophthalmologists for eye examinations, podiatrists for routine foot care, dietitians for help in planning meals, and diabetes educators for instruction in day-to-day care. The goal of diabetes management is to keep blood glucose levels as close to the normal (nondiabetic) range as safely possible. A recent Government study, sponsored by the National Institute of Diabetes and Digestive and Kidney Diseases (NIDDK), proved that keeping blood sugar levels as close to normal as safely possible reduces the risk of developing major complications of diabetes. The 10-year study, called the Diabetes Control and Complications Trial (DCCT), was completed in 1993 and included 1,441 people with type 1 diabetes. The study compared the effect of two treatment approaches -- intensive management and standard management -- on the development and progression of eye, kidney, and nerve complications of diabetes. Researchers found that study participants who maintained lower levels of blood glucose through intensive management had significantly lower rates of these complications. Researchers believe that DCCT findings have important implications for the treatment of type 2 diabetes, as well as type 1 diabetes. NIDDK supports basic and clinical research in its own laboratories and in research centers and hospitals throughout the United States. It also gathers and analyzes statistics about diabetes. Other institutes at the National Institutes of Health also carry out research on diabetes-related eye diseases, heart and vascular complications, pregnancy, and dental problems. Other Government agencies that sponsor diabetes programs are the Centers for Disease Control and Prevention, the Indian Health Service, the Health Resources and Services Administration, the Bureau of Veterans Affairs, and the Department of Defense. Many organizations outside of the Government support diabetes research and education activities. These organizations include the American Diabetes Association, the Juvenile Diabetes Foundation International, and the American Association of Diabetes Educators. In the future, it may be possible to administer insulin through nasal sprays or in the form of a pill or patch. Devices that can "read" blood glucose levels without having to prick a finger to get a blood sample are also being developed. Researchers continue to search for the cause or causes of diabetes and ways to prevent and cure the disorder. Scientists are looking for genes that may be involved in type 2 diabetes and type 1 diabetes. Some genetic markers for type 1 diabetes have been identified, and it is now possible to screen relatives of people with type 1 diabetes to see if they are at risk for diabetes. The new Diabetes Prevention Trial -- type 1 diabetes, sponsored by NIDDK, identifies relatives at risk for developing type 1 diabetes and treats them with low doses of insulin or with oral insulin-like agents in the hope of preventing type 1 diabetes. Similar research is carried out at other medical centers throughout the world. Transplantation of the pancreas or insulin-producing beta cells offers the best hope of cure for people with type 1 diabetes. Some pancreas transplants have been successful. However, people who have transplants must take powerful drugs to prevent rejection of the transplanted organ. These drugs are costly and may eventually cause serious health problems. Scientists are working to develop less harmful drugs and better methods of transplanting pancreatic tissue to prevent rejection by the body. Using techniques of bioengineering, researchers are also trying to create artificial islet cells that secrete insulin in response to increased sugar levels in the blood. For type 2 diabetes, the focus is on ways to prevent diabetes. Preventive approaches include identifying people at high risk for the disorder and encouraging them to lose weight, exercise more, and follow a healthy diet. The Diabetes Prevention Program, another new NIDDK project, will focus on preventing the disorder in high-risk populations.